Leaked funding documents reveal an effort by George Soros and his foundations to manipulate election laws and process rules ahead of the federal election far more expansively than has been previously reported. The billionaire and convicted felon moved hundreds of millions of dollars into often-secret efforts to change election laws, fuel litigation to attack election integrity measures, push public narratives about voter fraud, and to integrate the political ground game of the left with efforts to scare racial minority groups about voting rights threats. These Soros-funded efforts moved through dozens of 501(c)(3) and (c)(4) charities and involved the active compliance with civil rights groups, government officials, and purportedly non-partisan groups like the League of Women Voters. The leaked documents also reveal deliberate and successful efforts to manipulate media coverage of election issues in mainstream media outlets like the The New York Times. Conservatives and Republicans have no opposing effort or source of funds that represents even a small fraction in opposition to level of the Soros-led manipulation contained in the leaked documents. The documents reveal that the Soros campaign fueled litigation attacking election integrity measures, such as citizenship verification and voter ID. It funded long-term efforts to fundamentally transform election administration — including the creation of databases that were marketed to state governments for use in voter verification. It propped up left-leaning media to attack reports of voter fraud, and conducted racially and ideologically targeted voter registration drives. 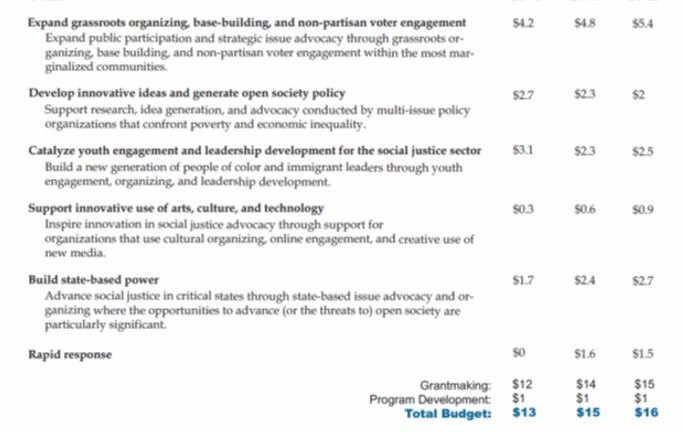 The increase in Democracy and Power Fund budget will expand funding of non-partisan voter engagement to catalyze participation from African-American, Latino, immigrant, and youth communities in particular, and to ensure a fair and just redistricting process. The increase in the Transparency and Integrity Fund will expand support for election reform, judicial independence and journalism. Below are some highlights of this expansive Soros-funded campaign to alter the legal environment and rules of American elections. Soros funded multiple attacks on state voter identification laws in places such as Wisconsin, North Carolina and Virginia. While not successful at the trial court in North Carolina and Virginia, the Soros litigation won a victory in the appeals courts resulting in North Carolina election integrity laws being suspended for the presidential election. Worse, the litigation resulted in opinions by federal appeals courts which could potentially turn the Voting Rights Act of 1965 into a one-way political ratchet that helps Democrats, as long as Democrats can enforce racially polarized voting patterns. Soros documents show funding for the League of Women Voters and their effort “to catalyze greater participation from Black and Latino youth in advocacy both before and after elections.” The LWV is currently in federal court trying to stop efforts by Kansas, Georgia, and Alabama to verify that only citizens are registering to vote. The same organization intervened in a lawsuit by the Public Interest Legal Foundation to clean voter rolls in a Virginia jurisdiction with more registered voters than eligible citizens. The funding documents name groups which received in excess of $500,000 each year from Soros. They include: “Leadership Conference on Civil and Human Rights, Center on Budget and Policy Priorities, Center for American Progress, Advancement Project, Center for Community Change, Brennan Center.” Three of the largest recipients are engaged in litigation and strategic communications denying voter fraud and seeking to transform the rules of elections. Soros money was directed at the Advancement Project and Brennan Center to influence media coverage on election integrity issues and provide voter fraud denial propaganda. Leaked funding documents state: “In a specific grant update, the U.S. Programs board-funded communications and messaging project was successfully led by the Brennan Center and the Advancement Project, and played an important role in the spike in media attention on voting rights this year. The groups developed affirmative voting rights messages and shared them widely in and beyond the field. The messages were used verbatim hundreds of times in sources ranging from The New York Times to the Philadelphia Inquirer, quickly and fully working their way into the media, national and local, and across social networking sites.” Verbatim. Soros funding documents reveal that the Brennan Center and Advancement Project, two organizations regularly opposing election integrity measures in court, were among the largest Soros funding recipients for the entire Soros program. ERIC, the program seeded by PEW to allow states to verify voter identity which many states now use, was started with Soros money and an “anonymous” donor. 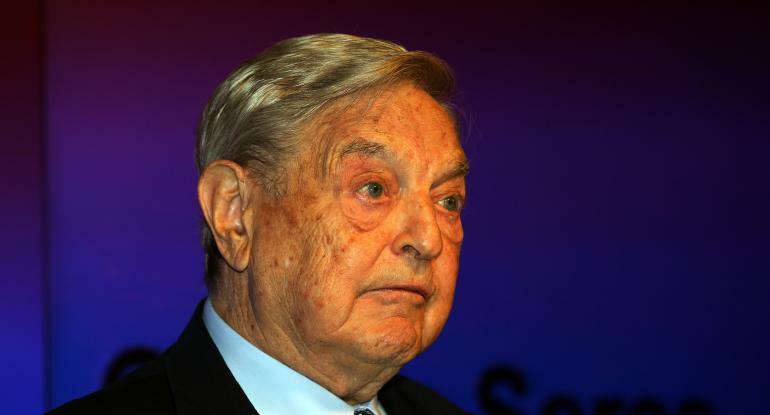 Soros money partnered with the Rockefeller Family Fund to push for changes to voter registration policies at the national level and gave money to Pew Center On The States to push for voter list maintenance practices favorable to Soros at the state level. After these grants were made, Oregon and California moved toward mandatory voter registration, where everyone who is on a government database is automatically put on the list of eligible voters. Legislation was also introduced in Congress to nationalize voter registration even though the Constitution gives power to the states to run their own elections. Soros money funded a variety of organizations to “broaden the voices calling for reform” including the Brennan Center for Justice which subsequently issued a report on mandatory voter registration. Soros money is funding some of the loudest voices who deny that voter fraud is a serious problem. These voices have produced poorly researched studies that are routinely cited by mainstream media to argue that voter fraud is a myth. Among the groups are the Brennan Center for Justice and the Advancement Project, two organizations that have opposed election integrity laws and have sought to stop the efforts of states to ensure that only citizens are voting. Soros grants also went to “New America Media,” which describes itself as “a nationwide association of 3,000 ethnic media organizations representing the development of a more inclusive journalism.” This mix of funding for media efforts with non-profit organizations that oppose election integrity was branded as “Broad and Equitable Access to the Ballot” in Soros funding documents. The leaked documents also reveal how Soros-funded organizations hector state and local election officials into adopting policies favorable to the left through hard work and behind-the-scenes pressure: “Advocates in Georgia have been sitting in on board of elections meetings to spot discriminatory voting practices, while those in Los Angeles have started working with the County Registrar-Recorder’s office to plan best practices workshops for the annual national election officials’ association convening this August.” Local voter rolls are infested with millions of ineligible voters, in part because local and state election officials refuse to do what is necessary to clean them. Soros-funded groups even swoop in after ligation to push narratives to voters about the results of Soros-funded litigation. One leaked document shows $158,000 was spent on this activity in Texas alone: “Texas Election Protection ($158,000): The Opportunities Fund grant supported last-minute voting rights work in the state of Texas to ensure that: (1) registered voters were aware of new voter identification requirements; and (2) advocates were able to collect data showing the continued discriminatory impact of voter ID laws. As a result of this grant, the 1-866-OUR-VOTE hotline received a record number of calls—up 45% from 2010.” This is a movement that spares no expense. Soros money specifically targeted voter mobilization efforts of racial minority groups that exhibit racially polarized voting patterns and can be counted on to support Democrats. For example, the “Democracy and Power Fund” was established to “inspire the participation of people of color, immigrants, young people, and low income people . . . . The fund invests in multi-issue advocacy, organizing and voter participation organizations that work at the federal, state and local level to expand access to democracy and build power for lasting social justice and systemic change.” This distinct effort from all of the other Soros activities involved over $15,000,000 in just the three-year period from 2010-2012 (dollars named below in millions). Soros money funds this “Media Consortium” according to leaked funding documents. Documents show that in one two-year period, another $200,000 in Soros money moved to the “Media Consortium” itself. The effort is described as “a network of leading progressive independent journalism organizations focused on making connections, building a media infrastructure, and amplifying the voices of progressive journalists in the United States. Over the past year, the Media Consortium has done much to build community and greater strength among progressive media outlets, and is creating a cooperative infrastructure that supports a sustainable future for journalists.” Progressive media outlets have taken the lead in denying that voter fraud exists and in opposing election integrity measures. Mainstream journalists frequently parrot progressive writers when covering voter fraud, thus rendering the Media Consortium Soros dollars well spent. Prior to the 2012 election, Soros organizations also planned to move millions to a swarm of downstream groups to fund organizing and political activities. 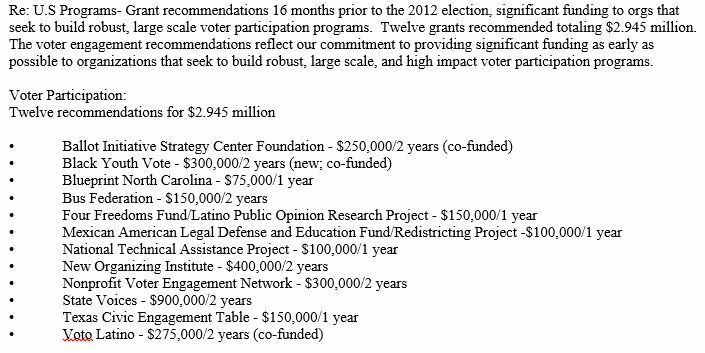 These include obscure names such as $300,000 for “Black Youth Vote,” $75,000 for “Blueprint North Carolina,” and $300,000 to the “Nonprofit Voter Engagement Network” to name just three of many others. $200,000 went to the Center for Civic Policy to engage “ordinary people in the policy debates that affect their daily lives through increasing voter turnout; educating and mobilizing the public on issues; and training new leaders for civic life.” The Center for Civic Policy is a tax exempt 501(c)(3) organization.